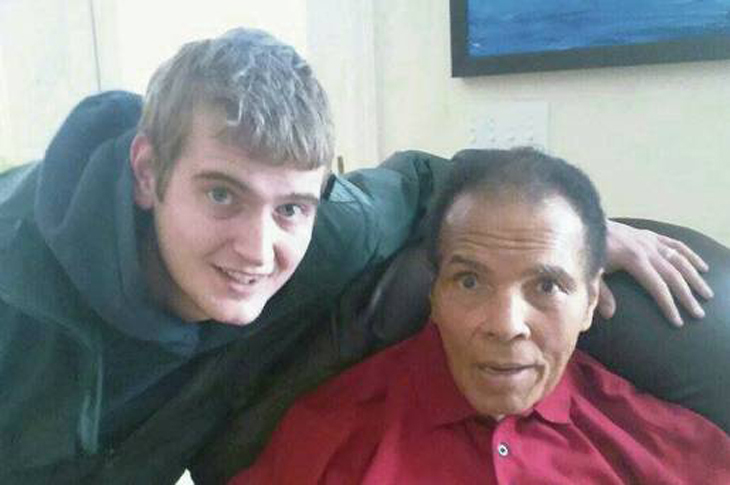 When plumber Tony Kelly went to work on Friday, not in his wildest dreams did the 24-year-old Irishman believe he'd get an opportunity to meet the legendary heavyweight champion, Muhammad Ali. But having the courage to knock on a door led to that opportunity for Kelly. The Irish Independent has a wonderful account of Kelly's surprise audience with Ali, who on Friday celebrated his 72nd birthday. According to the Independent, Kelly moved to Louisville, where Ali lives, after marrying his wife, Megan, in November 2012. On Friday, Kelly went out to a home to repair a set of burst pipes. Some of his colleagues told him that Ali lived across the street. Kelly was skeptical, but he also is a big fan of Ali's and so he went over and knocked on the door. Ali's wife, Lonnie, answered. We were working last Friday and some of my workmates said that Muhammad Ali in the house across the street. I thought it was a wind-up so I decided to call their bluff. I knocked on the door and Ali's wife Yolanda answered and I just asked would it be possible for one of his greatest fans from Ireland to meet him. She said 'Of course' and invited me in and there he was (Ali) sitting in the living room. Kelly had a brief visit with Ali and wound up having Ali's wife take a photo of him with the champ. Kelly told the paper that he "was over the moon," and that the Alis "were so pleasant." Kelly wound up with the last laugh when he went back to the shop and showed his colleagues of his photo with Ali, who was born and raised in Louisville. It was a once-in-a-lifetime experience, but hopefully, Kelly's good fortune isn't going to lead to a parade of photo seekers heading to Ali's front door.